We have had a bumper crop of jalapenos & little spicy red peppers (no idea what they are, Matt picked them up at the Friends Sale) this year despite the cool summer. On top of that Matt hasn't been able to resist buying trays of peppers at the Kingfield Farmers Market for only $2.00. There is no way we can go through that many hot peppers so we decided to pickle some. I did a batch that is just jalapenos. I figure this is the batch I can eat since most other peppers are a little too spicy for me. Then Matt made a batch with banana peppers, little red peppers & a few jalapenos thrown in. Pickled peppers are super easy to make. You just make your vinegar & garlic solution & pour it hot over sliced peppers. This recipe is easily adapted for the amount of peppers you have. The peppers are good in sandwiches (totally great on a banh mi) or even straight out of the jar as a snack. Prepare five half-pint jars by boiling them for 20 minutes. Boil the lids for 5. Pack the hot jars with the peppers leaving a 1/2-inch headspace. Pour the hot vinegar solution over the peppers still leaving the 1/2-inch headspace. Remove any air bubbles & add more liquid if needed. Clean the rims of the jars, place the lids on top & hand tighten the neckbands. Process in boiling water for 10 minutes. Turn the heat off & let sit for 5 more minutes. Remove the jars without drying them & let them cool undisturbed for 12 - 24 hours. The lids should pull downward with a pop. 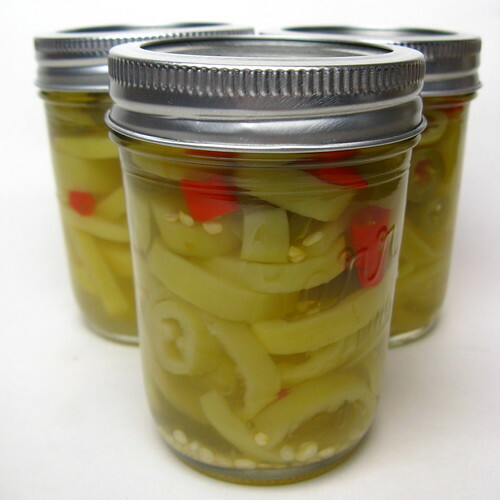 Any jars where the lid does not pull downward need to be refrigerated & used or reprocessed. you can also put them on hummus sammies and pizzas during the winter. oh the possibilities are endless. You'll have to let us know what you think of them in a few months or so. I pickled banana peppers last summer and while the flavor is awesome... the texture isn't... they're kinda mushy... not crisp like the one you buy at the store. Oh, I would love a jar of your pickled banana peppers. LOL!! They will be great with pizza, a tuna fish sandwich, steaks, and more. You are convincing me that I must perfect the skill of canning. I'd love to have a jar of these to open up and have in my chili come mid-October! I am here at my brothers in TN and there is a ton of jalapenos that he has already can and some waiting to be canned. I throw little matchsticks of carrots in with mine. It adds a touch of sweetness and color and they taste great too. I think it was a great year for peppers. I just bought a bunch of jalepenos for a centerpiece and was wondering what I was going to do with them! 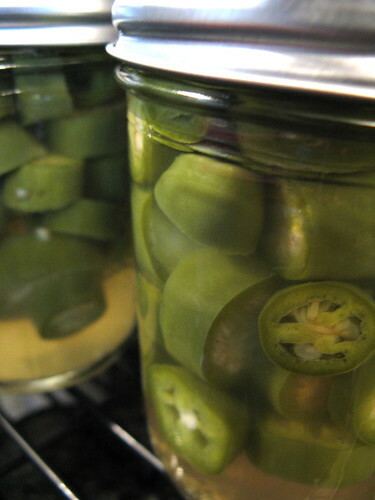 My son loves pickled jalapenoa, never knew it's this simple to make. Thanks for the recipe. Wow, I am so impressed. My poor little jalepenos will probably be hit by frost before they grow big enough to harvest. Let’s not even mention the tomato plants! *sigh* Your peppers are just beautiful...good job! Put 2-3 peppermint leaves in the bottom of your jar when canning peppers to keep them crisp. I don't grow peppermint, so I substituted spearmint.